There are several problems with attempting to replicate this for the UK. It may be that these problems are insurmountable, and it may be that my attempts to deal with those problems have created new ones. Still, this is a work in progress and I am looking for feedback. 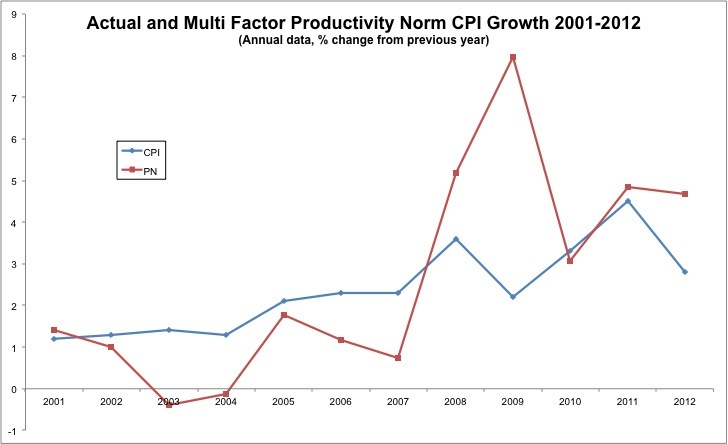 What this shows is that productivity gains should have generated a benign deflation in 2003-2004, but also that policymakers should have allowed inflation to go higher during the 2008-2009 crisis than they did. 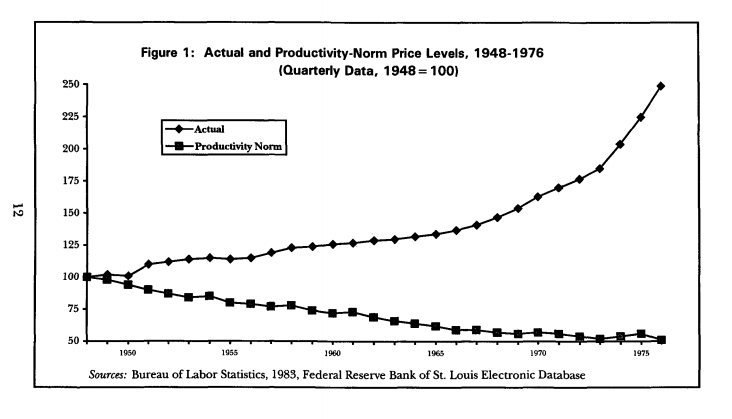 I also wanted to look at more reliable, and quarterly data, and therefore used Labour Productivity (I was bouyed by Scott Sumner's claim that the difference between Labour and TFP isn't all that important). The chart below shows the growth rates from 1997-2014 using the same method as above. Once again we see several periods where positive inflation appears too hgh, with several points at which a productivity norm inflation rate would have been negative. It then spikes up significantly higher than actual CPI before coming into line more recently. Given that the productivity data is only available quarterly this doesn't incorporate the 0% CPI we have seen this month. Because I suspect this is the most interesting of the charts presented here, this will be the one that we update regularly in our data section. It is telling us something interesting, but I'm not sure if the narrative is supported strongly enough by the theory and methods employed.